By now everyone knows that Donald Trump has been elected president of the United States and will begin serving his term in January 2017. No matter who is president, everyone living in the U.S. has certain basic rights under the U.S. Constitution. 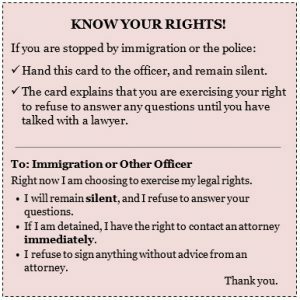 Undocumented immigrants have these rights, too. It is important that we all assert and protect our basic rights. To print the above card, click on the card’s image, then press Ctrl-P on your keyboard. Nonprofit organizations that provide low-cost help can be found at immigrationlawhelp.org. The immigration courts have a list of lawyers and organizations that provide free legal services: justice.gov/eoir/list-pro-bono-legal-service-providers-map. At https://www.adminrelief.org there is a search engine into which you type a zip code and then are given a list of all the legal services near you. You can search for an immigration lawyer using the American Immigration Lawyers Association’s online directory, ailalawyer.com. The National Immigration Project of the National Lawyers Guild also has an online find-a-lawyer tool: https://www.nationalimmigrationproject.org/find.html. Read NILC’s tips on how to prepare for a raid—in English or Spanish. 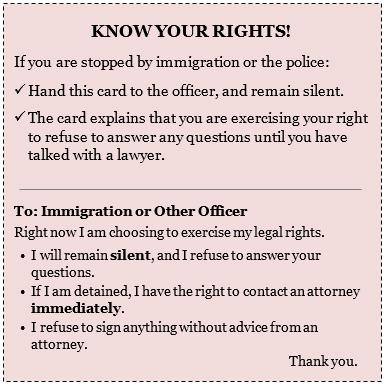 Read resources and booklets in English and Spanish by the American Friends Service Committee and Casa de Maryland: https://www.afsc.org/category/topic/know-your-rights.